Sir,—Your report (December 29) stated that Sir Charles Curran, in reply to Mrs Mary Whitehouse's complaint of an alleged sadistic scene in Dr Who, admitted to it being "too realistic." In these circumstances, one wonders if the "head of the department responsible would also "with hindsight ... have liked to have cut out" a sadistic scene shown on BBC-2 on Monday, December 27, when a woman was pushed into an oven and flames were shown consuming her. APA 6th ed. : (1977-01-04). A rebuke for Dr Who, but why wasn't Engelbert roasted?. The Guardian p. 8. MLA 7th ed. : "A rebuke for Dr Who, but why wasn't Engelbert roasted?." The Guardian [add city] 1977-01-04, 8. Print. 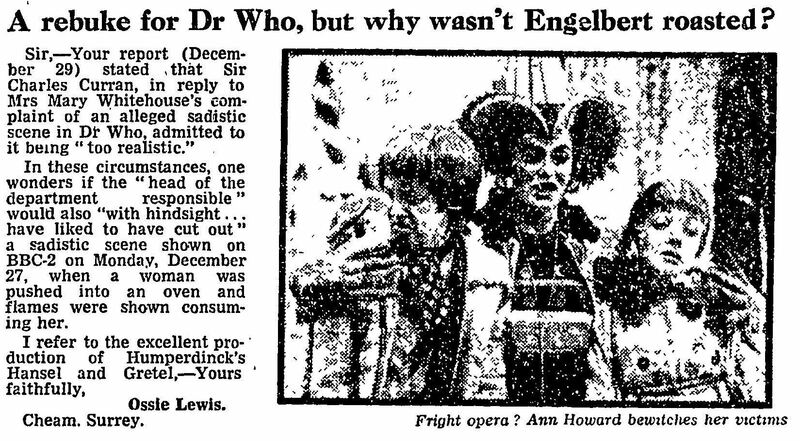 Turabian: "A rebuke for Dr Who, but why wasn't Engelbert roasted?." The Guardian, 1977-01-04, section, 8 edition. This page was last modified on 18 December 2014, at 23:49.